The history of Dorchester goes back 6000 years for there has been a settlement there for at least that time. The town itself was founded by the Romans after their battle at Maiden Castle against the Celtic Durotriges tribe in 43 AD. Artefacts have been found showing Stone Age and Bronze Age habitation as well as Celtic. Its Roman name was Durnvaria. It is probable that it was a garrison town to start with until the local tribes had been subdued around 70 AD. When the Romans left around the fourth century it is likely that it returned to Celtic occupation. Saxons inhabited the area from around 864 and the town's name gradually devolved into its present form from Roman, Celtic and Saxon roots. 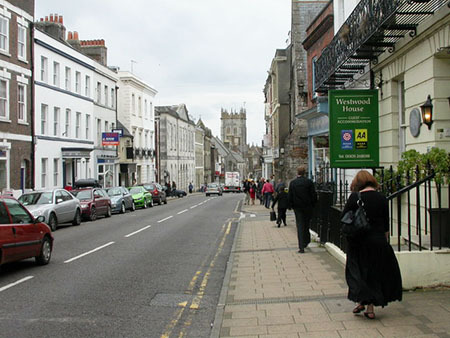 In more modern times the town became the capital of Dorset and is a pleasant market town set in the Frome Valley. It makes an excellent centre for exploring the historical sites of the area. Why not indeed - check out the accommodation, cars and public transport links in the right hand column. Everything you need for your planning of a pleasant break. Dorchester is a quiet country town in many ways despite being the capital of the county. Some were born in Dorchester, some lived here and for another it was an event in Dorchester. A companion page to this one gives more detail, please click the link in the heading above this section. Peter Robert Russell Wilson MBE born in Dorchester in 1986. Sports Shooter. Tom Roberts (1856-1931) Famous Australian painter born in Dorchester. Thomas Hardy (1840-1928) Dorchester's most famous son. Author and poet. William Barnes (1800-1886) He was a poet, some of his poetry was in the Dorset dialect. Hanging Judge Jefferies (1645-1689) Presided over the trials of Monmouth rebels in the southwest and one was in Dorchester. The Bloody Assizes as it became known was in 1685. Reverend John White MA (1575-1648) Organised the sailing of 150 emigrants to found Dorchester in Massachusetts, USA. Dorchester's history is so long that there are several historical sites that go back thousands of years in some cases. 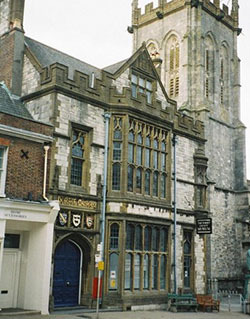 Dorset County Museum in High West Street, Dorchester is an excellent introduction and well worth a visit. 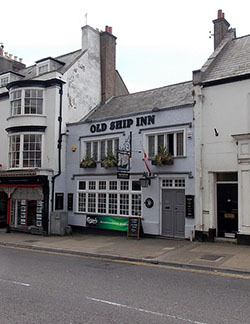 A short break in Dorchester to explore these interesting places is an excellent idea. The countryside around is rural and very pleasant. Make a good relaxing break too like Dorchester itself. Try the right hand column for accommodation and transport, car, train and coach. A quiet country chocolate box cottage would be nice! Run by English Heritage and open all the year. It was the Dorchester of its day by the time the Romans attacked in AD43. Its name describes it, the Celtic “Mai Dun” means great hill and it is. Very ancient in human habitation and at 47 acres the largest Iron Age Hill Fort in Europe. 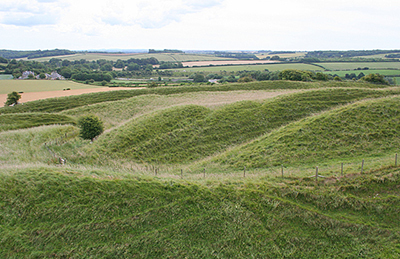 Founded about 3000 years ago and inhabited by the Celtic Durotriges Tribe, Maiden Castle was built on an even earlier Neolithoc site founded about 3000 years before that. With all that history behind it the organisation and fortifications would have been considerable. Evidence of this is all around, multiple ramparts with steep banks and deep ditches all speak of the intensive labour it would have taken to build, albeit over centuries It must have been a difficult task to capture. It took Vespasian, the seasoned Roman general, to win what would have been a terrible conflict. Artefacts have been found from the Stone and Bronze Ages. Coins minted by the Durotriges at Hengistbury Head on the coast have been found on the site. Sadly there is no inscription and so there is no evidence of their rulers. Bronze Age burial mounds can be found at the end of the castle. A Middle Bronze Age hill fort. These forts needed a good view all over the countryside and here wide views exist over the River Frome and its valley. The pattern of the rectangular earthworks can be seen with massive banks, terraces and ditches built over the centuries of occupation as needs arose. During the 4th century BC they faced the banks with timber and it is about this time they built the massive ditch. In around 50 BC they added a refinement when they again enlarged the banks and put in a revetment of limestone to protect the slope, but whether just against erosion or an added defence is perhaps conjecture. It is more like to be erosion and may be the reason the banks had to be extended. 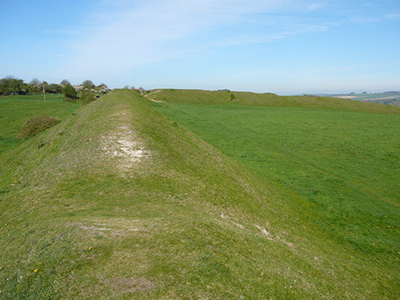 When the Romans built their Aqueduct that runs into Dorchester they damaged the outer defences on the northern and eastern sides of the fort. Doubt the locals could protest at the time. The local people did argue when Brunel wanted to run the Dorchester to Yeovil railway through a cutting in the ramparts of the fort. Brunel had to settle for spending more money on a tunnel underneath. Protests were so intense that it led to the formation of the Dorset Archealogical Society. On the north east side of the fort is a cemetery used by the local population and the Romans in around the 4th century AD. It was built as a henge during the late Neolithic Age. A henge is more of a ritual site than a defensive one. There was a large bank with 45 shafts, about 10 feet apart and over 30 feet down. Some of these shafts have been excavated and skulls have been found. An ancient site that has continued to be used from about 2500BC and is still in use today. Well worth a visit. It is free and open all year. Just a few minutes walk from the town centre. The Romans loved their amphitheatres and Maumbury Rings was an ideal place to convert to one close to their town of Dorchester. During the early part of their occupation they adapted this site and made one of the largest amphitheatres in the country there. They dug down into the centre and used the soil they dug out to renovate the bank to their requirements. They only used it for about fifty years. The town needed defences during the Civil War and Maumbury Rings was a useful site for an artillery fort. Now it has come into its own as an entertainment centre again. It is used for Dorchester's Arts Festival held in May every two years, and has been used as an ideal venue for other live performances, even a fireworks display. The Roman's engineering is well known all over the country. In this town they built a five and half mile long aqueduct to supply their bath houses. It can be easily seen from the town end – a terrace with a gentle gradient towards the town. Passes the edge of the new town of Poundbury, A waste channel also existed into the River Frome.